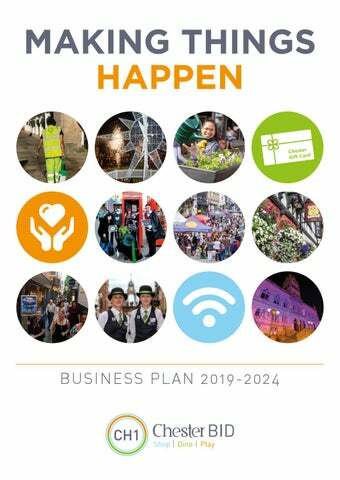 On behalf of CH1ChesterBID, it gives me great pleasure to present to you the CH1ChesterBID Business Plan 2019-2024. This document is in two sections; Part One takes you through what we have achieved together for Chester city centre so far. Part Two outlines our vision for Chester and what you can expect from your Business Improvement District over the next five years. Many of the projects and initiatives delivered by the BID have become part of the fabric of Chester and are key elements of the ‘Chester’ experience. Whether we are greeting visitors, helping the city to run smoothly or encouraging shoppers, all of our initiatives are focused on supporting our businesses and helping to set Chester apart from the competition. Looking forward, we have ambitious plans to make Chester a city fit for the future; a city that meets the needs of its businesses and a city that is attractive to the modern consumer. Chester’s competitors are not standing still therefore we need to work together and rise to the challenge. Now, more than ever, there is a need for businesses in Chester to collaborate in order to face challenges and seize opportunities. CH1ChesterBID only exists because businesses voted in favour of its creation, and as a democratic initiative, they now have the opportunity to decide if they would like the BID to continue or to end by way of a BID ballot. This is an important decision for businesses as the outcome of the ballot will have a significant impact on Chester. Vote yes and we can build on our success and deliver even more. Vote no and everything the BID currently delivers will come to an end. A yes vote will see your BID build on the foundations of the first five years and provide you with the help and support you need to succeed. Additional income In addition to the contributions made by businesses via the BID levy, we have generated almost £342,000 through grants and commercial activity. This additional income has enabled us to make your levy contributions stretch further, deliver more and ensure as much of your BID levy as possible is spent on making a real difference to Chester. A Business Improvement District (BID) is an initiative where businesses within a designated area come together to fund improvements to their trading environment. To deliver the projects identified by businesses, CH1ChesterBID was set up - a business-led, not-for-profit organisation focused on establishing Chester as the destination of choice for both consumers and businesses alike. Back in 2014, Chester businesses voted in favour of establishing a Business Improvement District in Chester city centre. CH1ChesterBID covers a defined area of the city centre and is funded by nearly 500 2019-2024 businesses who each make an annual financial contribution relative to the rateable value of their business premises. Since it began, CH1ChesterBID has invested over £2.5 million into Chester city centre. CH1ChesterBID is accountable to its members. The BID Board links the BID Team with the Chester Business community and helps to guide, shape and support BID initiatives. City Centre Management To help the city run as smoothly as possible, and ensure businesses have somebody they can approach for help and support, we employ a City Centre Manager. Nick assists businesses on a wide and varied range of operational matters, including: waste management, challenges with busking, tackling anti-social behaviour and planning. Welcome Ambassadors Our Welcome Ambassadors, Monica and Luka, have become the faces of Chester. They are on-hand to greet visitors to the city and provide help and assistance when required. Their role has expanded over the years to become the BID’s eyes and ears, logging environmental and anti-social behaviour issues with the relevant authorities and regularly meeting with businesses to ensure you have a regular point of contact for your BID. Floral Displays and Chester in Bloom To enhance Chester’s stunning architecture, we introduced summer floral displays in the heart of the city for the first time in 2015 and have expanded the scheme year on year. In 2018 the quality of floral displays was recognised by the Royal Horticultural Society when we were awarded ‘Silver Gilt’ in the North West in Bloom competition. City Cleansing To ensure Chester is clean and welcoming, we regularly bring in contractors to deep clean shop frontages and privately-owned land not maintained by the local authority. Our annual Spring Clean initiative also enables our businesses to participate in giving something back to the community by helping to tidy up neglected areas. We have also implemented an ongoing programme of pigeon proofing and set up regular liaison with the Council’s Environmental Health team, which has enabled us to actively tackle pest problems in the city. Tackling Empty Units Over our first term, we have prioritised tackling the problem of empty units at strategic locations across the city centre. We have installed informational signage, maps and mock shop fronts to enhance the overall appearance. We collaborated with local artists and photographers to ensure that the signage we installed was in-keeping with the Chester landscape. We have also used the signage to direct visitors to our BID members who have businesses on The Rows or in hidden locations. Brendan Cook and Yvonne Bancroft, RHS North West in Bloom judges. To date, over 300 businesses have taken advantage and saved more than ÂŁ200,000. Chester Against Business Crime We are proud to be part of Chester Against Business Crime, an award-winning partnership between local businesses, the local authority and Cheshire Police. The partnership aims to combat all aspects of crime that impact the business community. Communication with our Members CH1ChesterBID.co.uk is our B2B website, providing a wide range of city centre and BID information. In addition, we publish monthly electronic and printed newsletters that we hand-deliver to each business along with quarterly performance infographics. Free Training To equip our businesses with the skills they need to grow, we have provided free training on marketing, branding and social media. We have also organised dementia awareness training and educated businesses on the national counter terrorism awareness initiative, Project Griffin. We jointly fund the collection of footfall and sales data and publish monthly reports to enable businesses to monitor how the city and businesses are performing. Promotional Spaces and Advertising Opportunities We provide our businesses with subsidised advertising and promotion opportunities through our subway poster sites and the promotional spaces we manage on Eastgate and Northgate Street. CH1ChesterBID works closely with evening economy businesses, public service providers and the third sector on a wide range of projects to improve the visitor experience. STREETSAFE MANUAL In collaboration with Police and Pubwatch, we developed a best practice guide for licenced venues. SAFE SPACE We were instrumental in the introduction of the Safe Space night-time welfare unit, which helps people stay safe on a night out whilst reducing pressure on local emergency services. PURPLE FLAG AWARD CH1ChesterBID is responsible for bringing together representatives from Chester Pubwatch, Cheshire West and Chester Council, Cheshire Police, Street Pastors, The University of Chester and city centre residents to work together to achieve the prestigious Purple Flag award. Purple Flag is internationally recognised as the standard for a safe, clean and well-managed night-time economy and is helping us to change the perception of Chester after hours. SUPPORTING THE NIGHT TIME ECONOMY STREET PASTORS Since the BID’s inception, we have provided direct funding to support the work of the Chester Street Pastors. We are an active member and attend regular Pubwatch meetings. We also help to facilitate training for workers in the night-time economy. EVENTS & MARKETING CAMPAIGNS Through initiatives such as The CH1 Chester Comedy Festival, Head Out Not Home and Food & Drink Week, we have highlighted Chester’s night-time offer and driven people into Chester city centre in the evening. Objective: To encourage local shoppers back into Chester and raise the profile of our independent businesses. Objective: To use technology to create a new and innovative way for consumers to discover the great range of independent places to eat out in Chester. Outcome: Over 50 businesses now participate in our monthly Love Local prize draw through engagement with their customers. We have produced blogs, video content and social media promotions for independent businesses. We also support national initiatives, such as Small Business Saturday. Outcome: Over 30 businesses took part and promoted their special offers through a custom-made, interactive website that was visited by 2,000 people during the two-week campaign. The ‘hunger game’ was played over 14,500 times! Experience Chester Website Objective: To create a website that is a one-stop-shop for people to find out where to shop, dine and play in Chester city centre. Outcome: In 2016 we launched www.experiencechester.co.uk; a consumer-focused website that promotes everything that is happening in Chester city centre to both locals and visitors. experiencechester.co.uk now attracts over 80,000 visits each year. It has become the go-to website for people to find out where to shop, dine and play in Chester city centre. Food and Drink Week Objective: To raise the profile of Chester’s wide range of restaurants, pubs, bars and coffee shops during January to counter the post-Christmas lull. Outcome: Website and social media takeover of BID channels. Online promotions gained a total reach of 37,754 and 1,712 engagements. We received 79 adverts from businesses, which provided consumers with unique offers and promotions throughout the campaign. Objective: To highlight Chester’s diverse retail offer and promote the city as the destination to find the latest trends in fashion and style. Objective: To create two-way communication with shoppers and visitors to Chester city centre. Outcome: Our month long ‘Style in the City’ campaign included online promotions, print advertising, fashion shows, giveaways and exclusive offers from a range of Chester’s favourite stores. Outcome: As consumers become more tech savvy, we have adapted our B2C communications to embrace the latest social media platforms. This has created a two-way communication stream with shoppers and visitors to Chester city centre. Public Relations Objective: To ensure Chester news and events are communicated effectively with audiences across the UK. Our PR success has delivered a significant ROI, generating PR valued at over £5.5 million with an advertising cost equivalent of £1.9 million. Outcome: PR is a key element of the BID’s marketing strategy. Over the last 5 years we have had over 1,500 news articles published in local and national publications In addition to significant radio coverage, we have repeatedly appeared on BBC, ITV and Channel 4 promoting our members, the BID and the city. Objective: To support businesses in raising awareness of Watergate Street, drive footfall and increase sales within BID businesses. Objective: To raise the profile of Chester and showcase our venues and BID businesses by establishing an annual comedy festival. Outcome: In 2018 we helped businesses to organise the first ever Watergate Street Festival, a day of family-friendly activities attended by thousands of visitors and supported by partners, including Chester Zoo. Outcome: The 2018 CH1 Chester Comedy Festival was the city’s very first comedy festival. Spread across 8 days Chester saw 26 renowned comedians attract thousands of comedy fans to 16 venues in the city centre which included our bars, restaurants and even Chester Cathedral. FREE Family Film Screenings Objective: To encourage families into the city centre. Outcome: Our free family film screenings take place throughout the school holidays at the Grosvenor Museum. There has been over 15,000 tickets booked. More than 90% of attendees reported that they stayed in the city and visited businesses and attractions. Over 15,000 tickets booked. More than 90% of attendees reported that they stayed in the city and visited businesses and attractions. Objective: To stage a large-scale city centre event that would attract new visitors, showcase the city’s offer and encourage return visits. Objective: To encourage customers to explore all parts of the city and drive them into our businesses. Outcome: In 2016 we helped bring the Wales Rally GB back to Chester for the first time in 25 years. The event attracted over 10,000 spectators who spent over £150,000 in the city and received live coverage on both BBC and ITV. Outcome: Seasonal trails have attracted thousands of families into Chester and through the doors of BID businesses. Themes include: Halloween Trick or Treating, Bumblebees & Butterflies, Dinosaurs, Owls and Eggs on Pegs. Objective: To use technology to help visitors engage with Chester’s history and heritage in a new and innovative way. Objective: To increase the offering of Chester’s markets and drive footfall into Chester city centre following their visit to the Chilli Festival. Outcome: Over 21,000 people did the Talking Walls trail around Chester, utilising QR codes to ‘call the walls’ and find out their history. Outcome: The Chilli Festival increased footfall by 12% and gained wide recognition on social media for the chilli eating competition! CH1 Customer Service Awards Objective: To celebrate the achievement of the people who work in Chester city centre businesses and highlight the high levels of customer service in Chester. Outcome: This initiative is now well-known and loved by Chester businesses and thousands of consumers vote for their favourite BID businesses in Chester city centre each year. We segment businesses into 15 categories and each of the three shortlisted businesses in each category receives a mystery shopper visit and full report. Objective: To use Chester’s heritage to engage locals and visitors through a series of history-focused events and activities. Outcome: Chester Unlocked and the Hoots Route Trail were ground-breaking initiatives that brought museum artefacts into the city centre businesses for the first time ever. Truly unique to Chester, the project attracted national TV and press coverage with PR valued at over £1 million . Objective: To support businesses to take advantage of the third biggest retail opportunity on the calendar. Outcome: Our largest city-wide trail with 50 businesses participating. Over 10,000 bags of sweets given out to families. Spooky characters interacted with the public and businesses creating countless PR and photo opportunities. Advertised in the Primary Times and Chester Standard reaching over 100,000 readers. In addition, 29,000 map packs were distributed attracting over 70,000 participants with 94% of them either shopping or staying in the city for food. CHRISTMAS Christmas Lights and Installations Key to creating a magical Christmas atmosphere are our spectacular seasonal light installations. We provide the lights on St Werburgh Street, St John Street and Pepper Street as well as the stunning Foregate Street Christmas Tree. The CheSTAR is a custom-made light installation unique to Chester. Standing over 7 metres tall and featuring over 20,000 sparkling lights. Images of the CheSTAR have been shared around the world. over 20,000 lights Christmas Light Switch On Parade The Light Switch On Parade marks the start of Christmas in Chester and attracts crowds of over 17,000 visitors. The event includes hundreds of participants, fireworks, snow machines and features such as Spot-Santa. ChELFie and ELFie are Chester’s official Christmas mascots who spend over 240 hours each Christmas greeting visitors and spreading Christmas cheer. They have distributed over 40,000 pairs of magic glasses and have been featured on Channel 4! Our Christmas hubs have seen us take over empty units to create magical winter wonderlands in the heart of Chester. Santa’s Post Office and Santa’s Workshop attracted over 20,000 children and our Storytelling with Santa experience, in partnership with Storyhouse, attracted 5,000 children and their parents into Chester! This countdown to Christmas competition started in 2017 and highlights potential gift ideas from 21 city centre businesses. The final giveaway is a giant family Christmas hamper that features gifts from over 20 of Chester’s high-street stores. TV Advertising Christmas 2018 saw us partner with Marketing Cheshire to produce Chester’s very first Christmas TV commercial. Broadcast for four weeks on Sky TV, the advert was seen by over 130,000 viewers. Radio Advertising Our annual Christmas radio campaign with Dee 106.3 Radio features 4 weeks of BID promotions, over 275 on-air mentions and live broadcasts from our businesses. The campaign reaches over 84,000 listeners per day and produces 1.8 million opportunities for listeners to hear our promotions. Print Advertising Full cover wrap of the Chester Standard and regional variations reaches 123,720 people. Primary Times - 50,000 copies distributed. Ultimate Guide - 60,000 copies distributed. have come to watch the Chester Christmas Lights Switch On Parade in the last 5 years. £647,423 PR Coverage for Christmas in Chester. City centre flyers distributed to businesses and customers - 30,000 copies distributed. Christmas takes centre-stage of our November and December online promotions, both on our website and social media. We re-skin experiencechester.co.uk and add our Chester elves and Santa to make the website appealing to visitors looking for a magical destination during the festive period. Acting on behalf of our businesses, we have worked with the authorities to develop practical solutions to ongoing issues. Helping visitors to navigate the city has seen us introduce maps into key locations around the city, such as car parks and coach drop off points. We introduced a loading/unloading extension to Bridge Street and Watergate Street in collaboration with the Council’s Regulatory Services department. We supported the Council’s ‘Supporting Business in Chester’ booklet to guide businesses to the appropriate council department. We have also begun to tackle the issue of empty units around the city, covering dozens of empty units with mock shop fronts and using them for directional signage to highlight the locations of our businesses. We represented businesses at Council Committee Meetings regarding the Council’s A Board Strategy. The Busking Code of Conduct was developed to mitigate the impact of buskers. Northgate Development - multiple presentations and Q&A sessions. Council Parking Strategy - over 50 businesses attended a presentation and Q&A session. Storyhouse - behind the scenes tour of the construction phase for BID members. Meet the Leaders - meetings with the Council Leader, Chief Executive and MP for Chester. C.A.T. Walk - walks around the city with the Community Action Team to highlight issues. Business Engagement Days - facilitated events, which provided businesses with opportunities to meet with senior council officers. LET’S CONTINUE THE STORY In the first term, we have: Helped increase footfall into Chester city centre. Year-end footfall in 2015 was 19 million visitors, by the end of 2018 this had increased to 21.8 million visitors. Developed and maintained solid relationships with our businesses and partner organisations. Increased the level of cleansing in the city centre. Introduced marketing campaigns pinpointed on Chester city centre businesses. Developed an annual programme of events that bring consumers into Chester city centre. Represented your views at key city centre stakeholder meetings. Generated almost £342,000 of additional income to be invested into Chester city centre. Help us to continue to improve and build on the work we’ve done by voting YES! THE CHANGING FACE OF CHESTER Chester is not the city it was back in 2014 when the BID first began. POLITICALLY The political landscape has changed significantly over the last 5 years. By May 2019 we will have seen: 2 x general elections, 2 x Prime Ministers, 2 x council leaders, 2 x local elections and 1 x Brexit referendum which has brought 5 years of political instability. Cheshire West and Chester Council change from a Conservative to Labour council. A new Chief Executive of Cheshire West and Chester Council appointed in 2018. Nationally, the government change from a coalition to a conservative majority to a conservative minority. TECHNOLOGICALLY The digital revolution has truly taken hold and technology is now integral to the way consumers and businesses interact with each other. The continued rise of the internet is changing the way that people buy services and goods, bringing about the biggest changes to the high street for a generation. What used to simply be a mobile phone is now a mobile computer. Smart phones are now firmly established as the device of choice for people to engage with each other, the internet and businesses. Social media has revolutionised the way people share and receive information challenging the traditional forms of advertising and promotion. STRUCTURALLY Since 2014 there have been several new developments within the city centre which have changed the way people access and move around the city. Storyhouse has opened, providing us with a leading cultural hub containing a theatre, library, cinema and restaurant. The Bus Interchange has moved from Princess Street to Gorse Stacks changing pedestrian flows around the city. Frodsham Street has been re-developed introducing a shared area for vehicles and pedestrians. CITY INVESTMENT The city has seen significant investment from both the public and private sectors with even more planned for the future. Investment by the hotel and leisure industry will see an increased number of overnight visitors to the city. Travelodge have demonstrated their commitment to Chester by opening their second hotel in the city. Premier Inn have signed up to open a new hotel in Pepper Street with additional hotel developments underway in Forest Street and Grosvenor Park Road. The Councilâ&#x20AC;&#x2122;s Northgate Development will be a mixed retail, leisure and residential scheme that will transform a quarter of the city centre. Chester is built on history and heritage however, it must look to the future if it is to succeed and compete against its rivals. CH1ChesterBID’s vision is to make Chester ‘A City Fit for the Future’. BIDs are now in operation in over 300 towns and cities across the UK. Locally, both Manchester and Liverpool have a BID, as do towns including Northwich, Birkenhead and Warrington. We want to create a city that embraces change, innovation and recognises the importance of a successful business community. To achieve this vision: We will futureproof our city centre by improving the city’s digital infrastructure. We will use all the experience we have gathered over term one to target resources at initiatives that drive footfall, increase dwell time and encourage consumer spend. CH1ChesterBID has built a reputation as one of the leading BIDs in the UK for developing innovative ideas and initiatives to tackle the challenges faced by our businesses. To ensure we keep up-to-date with the latest BID industry developments, we are active members of several BID organisations: West Cheshire BID Group Founder members of the group set up to represent BIDs in our local region. Northern BIDs Group A collective of the North’s most influential BIDs including Leeds, Newcastle, Sunderland, York, Liverpool, Manchester and Sheffield. We will ensure the views of our businesses are heard and help to shape future city centre developments. Institute of Place Management The international professional body that supports people committed to developing, managing and making places better. We will work with organisations such as CWaC and Marketing Cheshire and partner with key city centre stakeholders to adopt policies and strategies that support and encourage city centre business. BID Foundation The BID foundation is the industry body for Business Improvement Districts. ATCM Association of Town and City Management. 86% of respondents said that the BID has had a positive impact on the city and the visitor experience over the last 5 years. Social Media e.g. Facebook, Twitter, Instagram etc. Consumer Website www.experiencechester.co.uk Marketing Campaigns e.g. Love Local, Head Out Not Home etc. YOUR PRIORITIES FOR THE FUTURE Which representation initiatives would you prioritise over the next 5 years? More business forums relevant to your business/sector i.e. independent businesses, Food & Drink, professional services etc. More opportunities to meet with city stakeholders i.e. Council, Police etc. Which city centre enhancement initiatives do you want to prioritise in the next 5 years? Which promotion initiatives would you prioritise over the next 5 years? We will share the results with you in regular evaluations that will be available on the CH1 website and in our annual review. Chester stands on the brink of the largest redevelopment in the cityâ&#x20AC;&#x2122;s recent history. The Northgate Development is a mixed retail, leisure and residential scheme that will see a quarter of Chester city centre redeveloped in several phases over the coming years. Good quality, affordable parking and an efficient transport system are key to ensuring staff, shoppers and visitors can access Chester city centre. CH1ChesterBID do not control any car parks in Chester so we have collaborated with partners such as Chester Race Company to provide free monthly parking at Chester Racecourse and Linenhall Car Park. Phase 1 of the Northgate Development was approved by Cheshire West and Chester Council in 2018 with building work expected to commence in late 2019/early 2020. This first stage of the development will include a new market, cinema, parking and restaurants. The Northgate Development has the potential to change the whole dynamic of the city by giving consumers new reasons to visit the city at different times of the day. Developments of this scale do not come without their challenges, not least of which how the city deals with several years of construction. We have already held multiple briefing sessions for BID businesses to ensure you are kept up-to-date with the latest developments. The BID will continue to facilitate these meetings and act as liaison with the Northgate Team, sharing relevant information such as timelines, schedules and planned works with businesses. On behalf of our members, we will continue to work with the Council to mitigate the impact of Northgate and ensure the rest of the city is considered throughout the development. We will use our links with Cheshire West and Chester Council, Chester Growth Partnership and other private sector stakeholders to ensure the views of BID businesses reach the key Northgate decision makers. At every opportunity, we will encourage the Council to adapt their Parking Strategy to benefit businesses, staff, shoppers and visitors. We will continue to explore opportunities with private car park operators to provide new parking initiatives. We will support the Chester Growth Partnershipâ&#x20AC;&#x2122;s involvement with Growth Track 360, the regional initiative to improve rail links to Chester. We will help the Council to understand the requirements of businesses to deliver an improved Park & Ride service that meets the needs of staff, shoppers and visitors. Business Forums You told us that you would like more opportunities to meet with local authorities and stakeholders. As well as the quarterly business engagement days we have established with the local authority, we will set up new business forums with a broader range of stakeholders to ensure the needs of businesses are heard. Strategic partnerships developed through the BID have benefited our businesses in a range of ways, from Chester Zoo supporting our events to free parking being provided by Chester Race Company. We will continue to develop new strategic partnerships on behalf of businesses to create new opportunities for our members. PROMOTING Marketing Campaigns Using everything we have learned over our first term we will deliver a fresh, new range of integrated marketing campaigns. These campaigns will focus on attracting new visitors to Chester and encouraging return visits at key times and seasons that have the greatest benefits for our businesses. You have told us that you would like to see more marketing campaigns that focus on attracting locals back into Chester. We will develop our ‘Love Local’ campaign that encourages consumers to choose local businesses rather than go online or to a retail park. ‘Love Local’ celebrates everything that is special and unique about Chester and sets us apart from the competition. You told us that the BID’s social media presence provides your business with the most promotional benefit. We will develop new and innovative social media campaigns that interact with consumers and link with our businesses. We will ensure we embrace the latest social media channels and take advantage of the most engaging content such as video and photos. The return on investment from our PR activity has been significant, generating £5.5 million pounds worth of coverage for the city and our businesses across TV, radio and print. Your feedback told us that you view our PR activity as a priority, therefore we will actively seek out news stories and opportunities to raise the profile of Chester across the widest range of media. Online Continued investment in both our websites will see us establish CH1ChesterBID as the online destination for businesses and consumers alike. www.ch1chesterbid.co.uk is our website for BID businesses and is kept up-to-date with the latest city and business news. We will continue to develop the site and introduce new features, such as a job vacancy section to give businesses a free resource to promote their vacancies. www.experiencechester.co.uk is our consumer-focused website hosting a business directory, events guide, special offers section and visitor information such as transport links. To support our marketing and events activity, we will work with our developers to produce new seasonal website takeovers and interactive web pages for consumers to engage with and encourage return visits. Events We will continue to deliver a diverse range of events that promote our businesses and showcase the city centre. You’ve told us that you prefer events that are spread over a longer period of time over large one-off events - our seasonal events calendar will prioritise key opportunities throughout the year such as Easter, Summer, Halloween and Christmas. We will support businesses to host in-store events linked to wider campaigns, such as CH1 Food and Drink week and CH1 Sparkle in Chester. You’ve told us that you want to attract locals and visitors from outside Chester. We will develop our trail concept to drive potential customers into stores and footfall to all parts of the city. We will develop and deliver innovative events linked to city-wide marketing and PR campaigns in order to raise Chester’s profile by bringing ‘firsts’ to our city centre, attracting customers from further afield. Once opened, we will collaborate with event organisers to take advantage of the new Market Square that forms part of the Northgate Development to attract quality on-street events that complement our businesses. Chester Gift Card To encourage return visits and ensure money is spent within Chester businesses, we will introduce a Chester Gift Card. Free to participating businesses, a gift card is a simple way for local people to buy a gift for friends, family and colleagues or for a business to reward their employees. Recipients can choose to spend their cards across any registered local businesses including restaurants, cafes, shops, salons, attractions and venues. Some of the benefits of networked gift card programmes: Locks in money for participating businesses. Free and easy for businesses to get involved with as it uses the existing Mastercard infrastructure. Consumers explore more when they have a gift card - over 15% of redemptions are made by consumers trying a business for the first time. Consumers spend on average 40% more than the value of the card they have been given. Local businesses and organisations can use them as incentives and rewards. Businesses are not asked for discounts. They receive the full card value plus any additional money the card recipients want to spend. A safe, welcoming and attractive environment was identified as high priority for businesses during the consultation. Throughout our second term, we will work hard to deliver a range of projects that enhance the quality of the city centre. Empty Units We will work with landlords and agents to attract new tenants into the city. We will also seek to improve the appearance of empty units through creating virtual shop fronts and window displays in conjunction with local artists and photographers. Cleansing Through the employment of specialist contractors, we will continue to carry out deep cleaning of areas which do not form part of the Council’s street cleansing schedule. This will include chewing gum removal on The Rows and the hot washing of privately-owned spaces and shop frontages. We will also work closely with the Council to ensure that any issues relating to general cleansing standards and waste management are promptly addressed. Safety and Anti-Social Behaviour Creating a safe environment for visitors at all times was identified as a key priority during our consultation. Our City Centre Manager and Welcome Ambassadors will continue to work tirelessly to build on our working relationships with Cheshire Police, Chester Against Business Crime, Pubwatch and Cheshire West & Chester Council to ensure that measures are put in place to tackle all forms of crime and anti-social behaviour that impact our businesses. Floral Displays We will continue to develop our award-winning seasonal planting programme, increasing the number of planters and incorporating artworks into our displays. Night-time Economy Christmas Lights We will continue to invest in spectacular light installations, such as the CheSTAR and enhancing Christmas lights across the city. We will work to maintain Chester’s Purple Flag status. We will continue to support the valuable work of the Street Pastors and contribute towards the provision the Safe Space. To help shoppers locate businesses and visitors find their way around Chester, we will continue to work with the local authority and other organisations to improve both digital and analogue signage around the city. In partnership with North West Ambulance, we will install defibrillators (AEDs) in a number of locations with public access to make Chester a ‘Heart Safe’ city. Wi-Fi The impact of technology on consumer behaviour over recent years has been nothing short of revolutionary. As mobile devices and smart phones become ever more powerful, they have changed the way consumers interact with each other, with their surroundings and with businesses. Ensuring easy, fast and reliable access to the data that these devices require to operate is key to future proofing the city. Chester’s digital infrastructure is not currently equipped to handle these technological advancements, so we will bring the city into the digital age by partnering with Cheshire West and Chester Council to install a free public Wi-Fi network. This Wi-Fi network will enable consumers to interact with businesses and their surroundings while ensuring the city is able to support next generation technology. The Wi-Fi network will enhance the visitor experience, directing users to find out the latest Chester offers, events and promotions. It will also benefit overseas visitors who face expensive data usage charges while giving Chester city centre the capacity to support data heavy events such as Pokémon. The Wi-Fi technology will also allow us to accurately understand how people move around the city and interact with their surroundings. This knowledge will help us inform future strategies for engaging with visitors to benefit our businesses. Like many other parts of the country, Chester has seen a rise in the number of people rough sleeping and begging and associated anti-social behaviour. To tackle the issue, in collaboration with ‘Outside In’ (a consortium local third sector organisation working to end rough sleeping) we will introduce a Diverted Giving Scheme that will provide funding to help get vulnerable individuals off the streets and into accommodation, whilst enabling them to access the support they need. Helping businesses to drive down costs remains a continued priority for many of you. Using our knowledge and understanding of businesses, we will continue to develop new opportunities for businesses to save money. Through our partnership with the West Cheshire BID Group we will use our combined scale to negotiate enhanced deals and offers exclusive to BID members. We have already raised ÂŁ47,000 in additional income through our commercial activities. This additional income allows us to spend your BID levy contributions on initiatives which benefit our businesses most. A revised commercial strategy will see us develop new income streams to supplement the BID levy with the aim of doubling our commercial income by the end of term two. The BID Board In order to provide the support and direction that the BID operational team require, and to represent BID members more effectively, we will review the BID Board structure. We will bring in new city stakeholders and business owners to re-energise the BID Board and ensure that the BID is better represented, leaner, smarter and as effective as possible. We fully understand the challenges ahead and we want to ensure that our Board, our BID team and our City Centre Strategy for the next 5 years enable us to deliver for all our members. Our new Board will endeavor to work more effectively with the local authority and challenge them when we feel our businesses need more support. We will join the dots with other city stakeholders and ensure clear and effective communication takes place between all so that key decisions can be made quickly, effectively and benefit city centre businesses. Chester is YOUR city, this is the future of YOUR business, and YOUR BID. In June 2019, you will receive a ballot paper through the post. If you do not want to lose the initiatives outlined above, vote yes. WE NEED YOU TO VOTE YES. Voluntary and Commercial Income is estimated and not guaranteed. The BID will only fund initiatives over and above the level already provided by the authorities. What area does the L ST ANA C BID cover? The BID is operated by CH1ChesterBID Limited (08898786), a not-for-profit company limited by guarantee. The objective of the company is to achieve or further the economic growth and development of the City of Chester through the delivery and operation of a Business Improvement District. CH1ChesterBID is overseen by the BID Board made up of levy paying businesses and/or key city stakeholders who all operate in a voluntary capacity. The BID Board will meet quarterly and is responsible for supporting the BID team, BID initiatives and ensuring the BID meets its objectives. At least 6 members of the BID Board will also operate as non-executive directors of CH1ChesterBID Ltd. BID directors will meet quarterly and assume responsibility for strategic direction, corporate governance, human resources, partnerships and standards. BID Levy Rules The term of the BID will be five years from 1st September 2019 to 31st August 2024. The BID levy rate will be fixed at 1% of rateable value for the duration of the BID as at 1st September 2019 based on the 2017 Rating List for hereditaments located within the BID area. Cheshire West and Chester Council may be represented on the BID Board by a council officer, a Councillor may also be co-opted to the BID Board as and when deemed appropriate by Board members. Hereditaments located within a managed shopping centre who pay a landlord service charge will be subject to BID levy discount of 0.25% offset by a voluntary contribution to the BID from each managed shopping centre. To ensure sound financial management CH1ChesterBID will operate an Audit & Remuneration committee made up of executive and non-executive directors of the BID Board. The Committee will be responsible for financial governance and meet no less than quarterly with meetings attended by the company secretary and external accountant. A lower threshold of £18,000 rateable value will be applied, exempting any hereditament within the BID area with a rateable value below this level from paying the BID levy. Audited accounts will be filed annually with Companies House and will be available to all BID levy payers. Financial reports will be included with the BID levy demand and the BIDs annual review. The BID team will be a combination of salaried and contracted staff led by a BID Manager, all staff are accountable to the BID Board. In the case of an empty premises, the property owner or eligible ratepayer will be liable for the BID levy with no void period and will be entitled to vote in the BID ballot. The BID will report to businesses through monthly online and offline newsletters, quarterly infographics, an annual review document that will detail BID finances and an annual levy payer meeting. No charitable or non-for-profit organisations will be exempt from paying the BID levy. The BID will enter into an operating agreement with Cheshire West and Chester Council. This agreement will detail the minimum service standards and the arrangements for the collection and enforcement of the BID levy, which will be carried out by the Council on the BID’s behalf and will be monitored annually. Billing, collection and enforcement is carried out on behalf of the CH1ChesterBID by Cheshire West and Chester Council. The baseline level of services provided by statutory authorities, such as the Council, will be available on our website www.ch1chesterbid.co.uk These levels will be monitored to ensure the BID only funds initiatives in addition to, or to a level over and above, baseline levels. Any rate revaluation during the term of the BID will be ignored for the purposes of calculating the Levy, unless the variation to the rateable value is due to a change of use or a physical change to the hereditament. Ballot papers will be issued between 4/6/19 – 6/6/19. The ballot will run for 28 days ending on Thursday 4/7/19 with the ballot result announced on 5/7/19 or the earliest possible opportunity after the ballot closes. The levy will be charged annually in advance and no VAT will be charged on the BID levy. The Levy will be collected under ‘daily charging’ terms with refunds issued reflecting changes in occupancy throughout the BID term. At least 51% of businesses that vote must vote in favour. The total rateable value of those that vote in favour must represent a greater rateable value than those voting against. Each of the 464 hereditaments within the BID area will have one vote provided they are listed on the national Non-Domestic Rates list on 9/5/19 and have a rateable value of over £18,000. The BID area covers: Abbey Green, Bell Tower Walk, Bridge Street, Bridge Street Row, Eastgate Row, Eastgate Street, Foregate Street, Frodsham Court, Frodsham Square, Frodsham Street, Godstall Lane, Love Street, Music Hall Passage, Newgate Row, Newgate Street, Northgate Row, Northgate Street, Paddock Row, Pepper Row, Pepper Street, Rufus Court, St John Street, St Michaels Row, St Michaels Square, St Werburgh Street, The Forum, Watergate Row and Watergate Street. If a business ratepayer occupies the premises for less than one year, the levy paid will be on a ‘daily charge’ basis and any appropriate refund will be made. New hereditaments added to the Rating List after 1st September 2019 will be levied at 1% of rateable value from the date, they are added to the rating list. The voter list has been developed through consultation with businesses by CH1ChesterBID using the Non-Domestic Rates list provided by Cheshire West and Chester Council as the source. New businesses will be charged from the date of occupation based upon the rateable value in the current rating list at the time they enter that list. The ballot paper will be issued to the person with responsibility for casting the vote on behalf of each company/organisation or the person/organisation named on the Non-Domestic Rates list on 9/5/19.